Get this book to see why we fight for our freedom. Note on PayPal if you want a signed copy.
. Really you have a singularly unique work here! I can't think of anyone who has done what you have here. It is original, fresh, and a totally new blunt perspective. Yet you make the reader laugh.... you have a gift Gary, you really do! Arrived today and I can't put the damn thing down!!! OMFG I love it!! Thank you sir. Thank you soo much!! "This book not only has a lot of great facts and insights showing that truth and good judgment are on the side of the conservative positions, but it had me laughing out loud many times with what he calls Brayisms (e.g. "An Inconvenient Trick", USSA, Obortion, etc.). I recommend this book as a highly entertaining and informative read :-)"
Brayn Food is the Encyclopedia of Obama’s corrupt ruling class. 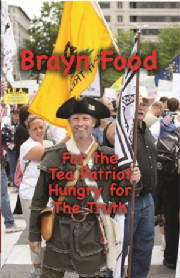 This is a book for Tea Partiers who want to understand the war they are fighting and who their enemies are. These 1 minute Brayn morsels explain this fight for the Freedom of America by a group of Revolutionaries carrying the thoughts and prayers of our Founding Fathers on handmade signs. This book strengthens and clarifies the Tea Patriots’ ideas in their Battle for Lady Liberty.